DECK RAIL PLANTER COLLECTION by Bloem: This planter is great for home or apartment use and helps you make the most of your porch or patio living space. Grow a mini garden in an elevated space. Compression design fits rail size 3.75" or 5.5" wide. Rail planter also works on widths slightly smaller (3" up to 3.75" OR 4.75" up to 5.5"). For smaller rail sizes we recommend securing with screws or zipties under railing for added stability (screws not included). Planter was designed to maximize inside growing space and features a tiered bottom design allowing dirt and roots to grow strong and deep. The planter feature a smooth texture with matte finish. Made of durable resin, this planter by BLOEM is 100-percent UV stable to prevent fading and cracking and ensures long-lasting use. BPA free. Includes optional punch out holes for drainage. Made in the USA. Use on patio, mailbox post, balcony, fence or deck railing. Capacity: 2 Gallons / Size: 12 in. Top width x 12 in. Bottom width x 9 in. Height x 12 in. Length UV stabilized plastic is fade resistant and will last for many years. Features optional punch-out drainage holes. Fits rail size 3.75" and 5.5" width. For smaller rails (3" up to 3.75" OR 4.75" up to 5.5") we recommend securing with zip ties underneath planter for added stability. 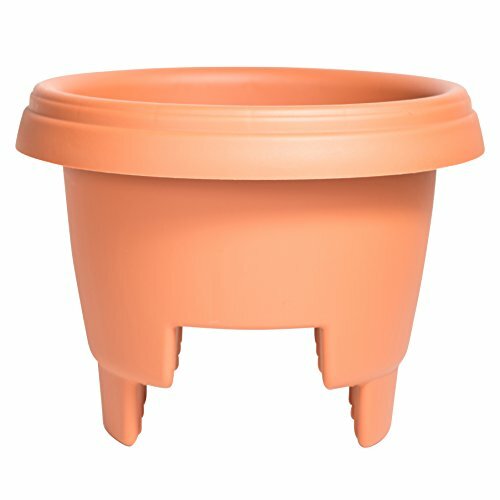 Includes 1 - Bloem Deck Balcony Rail Planter 12" Terra Cotta FDA approved for contact with edibles & BPA-free (plastic code 2 & 5).